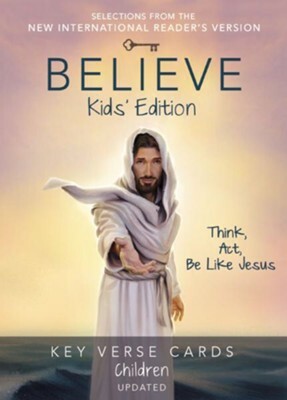 Believe Key Verse Cards for Children includes thirty cards which correspond to the Believe Children's Curriculum. Use as a take-home piece to help children memorize the key verses studied each week. Order one per child or family. This set of key verse cards, created to correspond to both the Believe Childrens Curriculum is sure to become a favorite take-away for groups. Each card includes the key idea on one side and the key verse on the other side, making it a perfect companion to help children memorize key scripture verses. These cards are also meant as a piece to be shared at home with parents, to show them the progress and the scripture that is being learned in the church setting and to act as a reminder of the importance of committing key verses to memory. I'm the author/artist and I want to review Believe Key Verse Cards: Children.